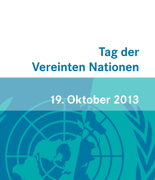 With the agenda “8 : 0 for development—Water connects!” the United Nations Day will take place in Bonn on 19 October. BICC will participate in the comprehensive program with an information booth in tent 4 on the Market Place. The United Nations Day 2013 in Bonn is an opportunity for UN Secretariats such as the Office of the Water Decade, Federal Agencies and International Organizations to present their work. Projects and cooperation activities, all with the focus on water, are presented and illustrate the close ties between all major challenges to the environment. There is hardly any other natural resource that represents both conflict and cooperation like water. When talking about land grabbing, the purchase of large portions of land by investors, access to water is always an issue. At the same time, transboundary cooperation of riparian states in Africa, for instance, has often been cited as an example of a peaceful reconciliation of interests. BICC has conducted research on both sides of the coin.